Rosslyn is often touted as one of the D.C. area's most well-connected neighborhoods and it's easy to see why: Rosslyn offers access to three Metro lines, three bus systems, five major road networks and an extensive system of bike trails. But did you know that Rosslyn is also the Northern Virginia hub for two express buses to New York City? Talk about convenient! Vamoose and TripperBus regularly travel between Rosslyn and New York City. They are affordable and efficient. 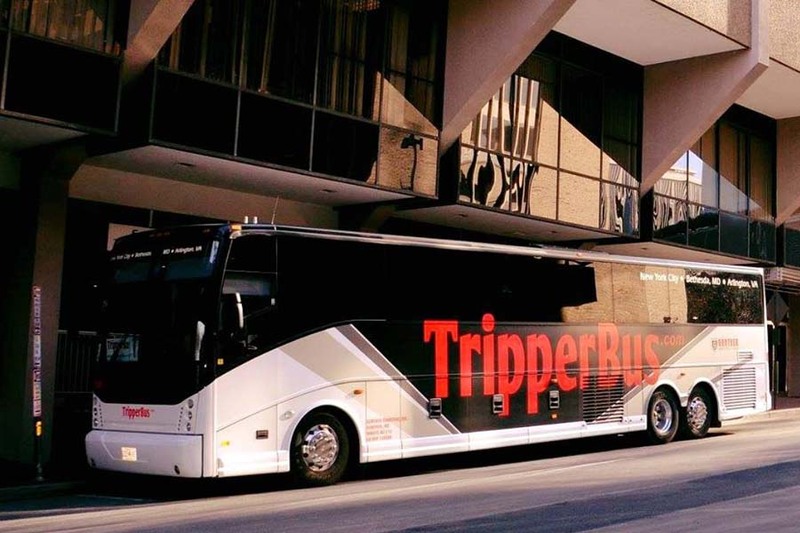 The TripperBus picks up passengers at 1901 N. Moore St. and drops off in Midtown Manhattan near Penn Station. Vamoose's pick-up spot is in front of Cosi at 1801 N. Lynn St. (corner of N. Lynn and 19th Sts.) and it also drops off passengers near Penn Station (7th Ave. at the corner of W. 30th St.). A TripperBus waiting to depart Rosslyn from its pick-up location on N. Moore St. Photo via TripperBus's Facebook page. As a Rosslyn worker or resident, it's totally doable to leave the office around 3 on a Friday afternoon, grab some carryout, and hop on a New York City express bus. You'll be in the heart of the city in less than five hours and you'll be fairly comfortable on the way. A return trip Sunday evening will get back to Rosslyn before 10 p.m. While TripperBus is a bit less expensive, Vamoose offers slightly more choices for departure times from Rosslyn (there are nine Vamoose buses leaving Rosslyn on a Friday compared with seven Tripper buses). Also, Monday through Thursday, TripperBus has a very limited schedule from Rosslyn, with just two buses leaving in the morning compared with Vamoose's buses, which are far more numerous and depart throughout the day. If you really want to save money, plan ahead! If you book in advance, costs go down! 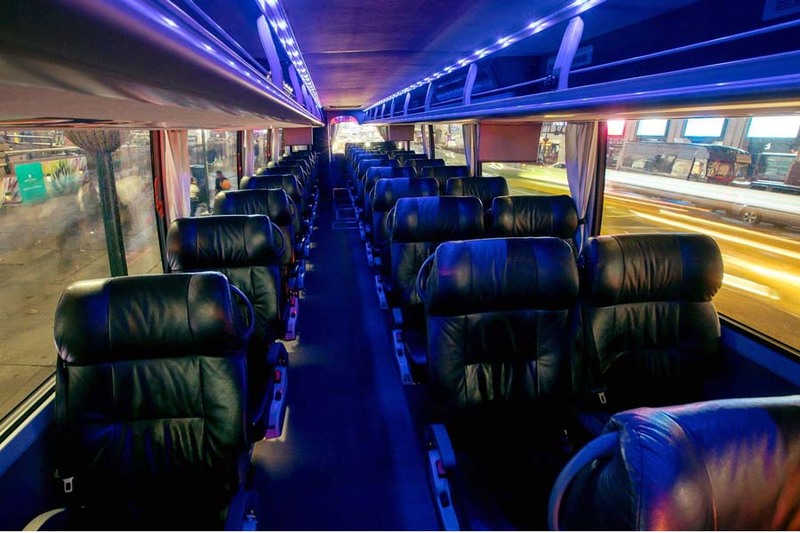 TripperBus is $27 one-way to NYC if you book three weeks in advance. Vamoose's one-way ticket price drops to $30 if you book three weeks ahead. You can change your reservation on both buses! TripperBus allows you to change your reservation up until midnight on the night before your trip. Vamoose allows changes up to two hours before your scheduled departure time. The general consensus among those who have taken these buses is that both are fairly comfortable. Several members of our team regularly take the bus to NYC on a Friday afternoon. This past weekend, a BID staff member took TripperBus home from NYC on Sunday. He reported that the bus was clean and the driver courteous. It had a restroom in back. It took about four hours to get to Rosslyn (the company's website says to expect it to take 4 1/2 to 5 hours). He thought seating felt a bit cramped, but you can purchase premium seating for a higher ticket price if you aren't comfortable with standard seating. Another staff member who takes Vamoose has similar positive comments: It's clean and always on time, she says. WiFi can be sporadic. She thinks Vamoose's drop-off location in New York is way more central and convenient than others, which is the main reason she prefers that bus. Several other friends we talked to echoed these sentiments: These buses are extremely convenient, affordable, clean and generally on time. Said another Vamoose rider: "I've taken this bus a couple of times and it's a cheap and easy way to get to the city. I go with a friend and we just yak all the way there. It's not luxurious but it's not bad either!" Both TripperBus and Vamoose have more luxurious coaches that operate at specific times if you want a slightly more comfortable experience. Vamoose's Gold Bus leaves three or four times per day from Rosslyn and costs $75 one-way, $150 round-trip if you book a few days ahead (the price drops to $110 round-trip if you book at least three weeks in advance). A Gold Bus has fewer seats so passengers have more space. Seats also have tray tables, electrical outlets, free WiFi and free movies you can download to your mobile device via an app. TripperBus's more upscale offering, TripperBus Elite, offers similar amenities to Vamoose's Gold Bus. It costs $105 round-trip if you book a few days in advance. Three weeks out, TripperBus didn't have an Elite bus leaving from Rosslyn on a Friday (and the cost of the Elite bus returning from NYC that Sunday was the same as it would have been had you booked short-notice). All this being said, it's time to plan your Rosslyn to NYC adventure. It'll certainly make winter more interesting! Learn more: TripperBus and Vamoose. The interior of a Vamoose Gold Bus. Photo via Vamoose's Facebook page.